Whoever said that dead men tell no tales has never met Cass Donnovan . 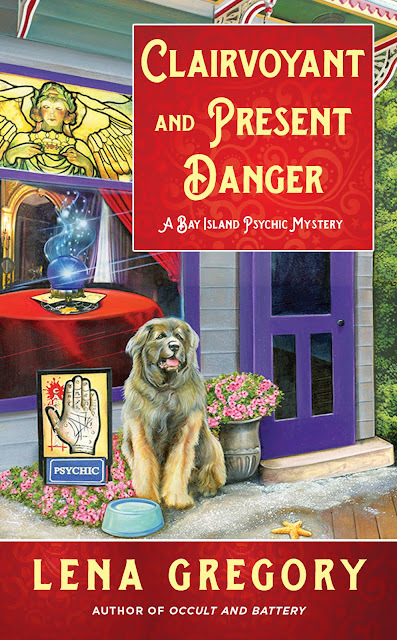 . .
Cass knows she is meant to help track down the killer--much to the chagrin of local law enforcement--when the apparition leads her to a dead body on the beach near her psychic shop, Mystical Musings. But the police are not the only ones who wish Cass would stick to reading palms. Someone is trying to scare her off, and it will take all her powers of premonition to catch the killer before Cass herself becomes the next victim . . .
After growing up on Bay Island, a small tourist destination between the north and south forks of Long Island, New York, Cass Donovan left to go to college, then open a psychiatric practice in New York City. After several years, she gave up her practice and returned to her hometown of Bay Island to open a psychic shop on the boardwalk. Now she enjoys doing readings for local residents as well as tourists and hanging out with her two best friends, Bee and Stephanie. Cass, how did you first meet Lena? After overhearing a conversation between Lena and her husband, regarding whether or not ghosts were real, I just had to step in. I approached Lena, who does believe in ghosts, by the way, and asked her to write my story. Of course, it took a little persuading, but she eventually got around to it. Well, one thing I can tell you is that she’s a master procrastinator. One minute I’d be talking to her, going on and on about what I wanted her to write that day, and the next, she’s on facebook chatting with friends and playing games. I’m not gonna lie, she can be a little frustrating. I think, generally, people are fascinated by what might exist beyond our own limited view of reality. Since I can tap into that other world, people are interested in hearing what else is out there. Plus, there’s always the debate about whether or not ghosts are real, which I can assure you, they are. My favorite scene is between Bee and Stephanie’s husband, Tank. Tank and Bee are about as opposite as two people could possibly get, and because of that, they don’t always see eye to eye. But when Bee gets it in his head that Tank has done something to hurt Stephanie, he steps up in a big way. Did you have a hard time convincing Lena to write any particular scenes for you? The hardest scene to convince Lena to write was the beach scene. She found it hard to believe I’d try to conjure a spirit on a deserted beach in the middle of the night with a storm coming. Boy, does she underestimate me! I love taking the ferry across to Long Island with Bee and Stephanie, especially in the fall. I visit the farm stands, eat roasted sweet corn and apple cider, and walk along the ocean beaches when they’re not crowded with tourists. I love my fellow characters! Bee is pretty much my best friend in the world. I don’t let the fact that he (supposedly, though I have my doubts) doesn’t believe in ghosts interfere in our friendship, and he accepts the fact that I talk to myself fairly regularly. And Stephanie is a sweetheart! We grew up together, and have lots of stories to share, but we drifted apart when I left Bay Island to go to college. As soon as I returned, we just picked up right where we left off. I’d pick up Bee and Stephanie and head to Tony’s Bakery for donuts and coffee. After that, I’d take Beast for a long walk along the beach, then maybe visit a few antique shops before heading over to the diner for dinner with my friends. The second worst thing that’s ever happened in my life was walking in on my husband and my friend. First, I learned not to trust my now ex-husband or my now ex-friend. Then, I learned how to pick myself up and move on after my world fell apart. As close as Stephanie and I are, Bee is probably my best friend in the world. He owns Dreamweaver Designs, a designer dress shop just down the boardwalk from Mystical Musings, and he is everything you could ever want in a friend; fun, talented, loyal, and willing to go along with pretty much anything. And he always has my back. He swears he doesn’t believe in ghosts, but I’m pretty sure that’s just a cover for his intense fear of anything otherworldly. And still, he helps me with my group readings, helps me now and then with seances, and even (reluctantly) helped me try to contact a spirit with a Ouija Board. Lena is an incurable insomniac. And when she doesn’t sleep, I don’t sleep. She often wakes me in the middle of the night, because she gets an idea she just has to write down before she forgets it. My life is going well right now, though a little confusing. Things have been happening that I can’t explain, and it scares me a bit, but I wouldn’t change it for anything. Bay Island is a small tourist island between the north and south forks of Long Island, New York. The town of Bay Island consists of two rows of stores facing each other across Main Street. During the summer, tourists flock to the beaches, the boardwalk, and the lighthouses, but during the winter months, things are usually very quiet. I live just down the beach from my shop, Mystical Musings, and I often start my day with a walk to work with my dog, Beast. Once I get the shop open, Stephanie and Bee often stop by with breakfast from the deli, along with a good dose of the day’s gossip. Then, I usually do a few readings and hopefully sell some souvenirs, essential oils, and crystals. My best days end meeting up with Bee and Stephanie at the diner for dinner. Will you encourage Lena to write a sequel? Absolutely! Even though I’m at a good place right now, I’d like to think there’s still more to tell. Lena lives in a small town on the south shore of eastern Long Island with her husband, three kids, son-in-law, and four dogs.